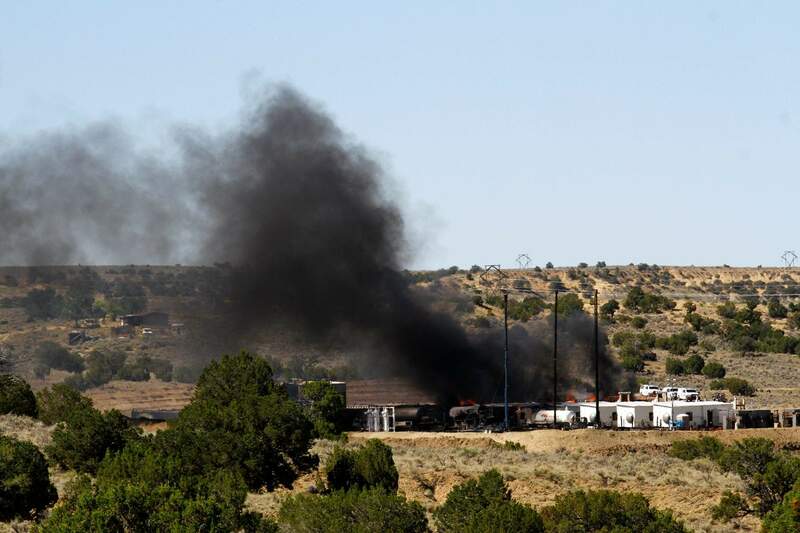 A fire continues to burn July 12 at an oil storage site near Nageezi, New Mexico. Authorities say no injuries were reported. Tulsa, Okla.-based WPX Energy says the fire started late July 11, and a cause has not been determined. A recent fire at an oil production site in New Mexico provided environmental advocacy groups with fodder for a long-standing argument: Federal agencies must weigh all impacts of mineral extraction before drilling begins. “These WPX Energy wells were producing for just one week before the entire site went up in flames,” a collective of environmental groups wrote in a letter Tuesday to officials at the U.S. Department of the Interior and Bureau of Land Management. While there were early reports from citizens of animals being killed by the fire, no such deaths have been verified, Kelly Swan, a WPX spokesman, said in an email. The July 11 fire erupted southwest of U.S. Highway 550 near Nageezi, New Mexico, about 14 miles from Chaco Culture Historic Park, and spread to 36 storage tanks on the 5-acre site. It was allowed to burn out over the course of five days. Though no one was injured in the blaze, nearby residents sharply criticized WPX Energy and federal officials for a lack of communication on the fire, and the possible health risks associated with air quality. Swan said the company held daily meeting in conjunction with emergency responders and housed some residents in a hotel during the emergency. The fight over new natural gas extraction in the Four Corners has found a recent battleground at Chaco Canyon, where since 2014, opponents of energy development in the archaeologically rich area have sparred with federal officials over a contentious lease sale. In June, the BLM delayed for the third time a three parcel sale totaling 2,122-acres in the San Juan Basin south of Farmington – sacred land for more than 25 tribes. However, officials for the agency said the sites could be up for auction as early as January. In the letter signed by Diné Citizens Against Ruining Our Environment, WildEarth Guardians, Natural Resources Defense Council and SJCA, the groups urged the BLM to place a moratorium on drilling Mancos Shale until its impacts are fully studied. “It is incumbent upon BLM to act as steward of our public lands rather than catalysts for private industry’s exploitation absent meaningful public participation and consideration of all potential significant impacts, including health and safety,” the groups wrote. Officials for the Department of Interior and BLM did not respond to requests for comment. WPX Energy officials said Wednesday the cause of the fire remains under investigation. This story has been updated to correct information about the start of the fire and include responses and clarifying information from WPX Energy.